The castle of Aigremont is perched on a cliff above the Meuse River. It is located in the town of Seraing, between Liege and Huy. Aigremont was first mentioned around year 900. Legends associate Aigremont to the Duke of Beuves, uncle of the four sons of Aymon, who resisted against Charlemagne. Aigremont was a major fortress in the middle ages and served as refuge to many dissidents of the Prince-bishops of Liege, for instance William of La Marck in 1468 (see history of Franchimont. 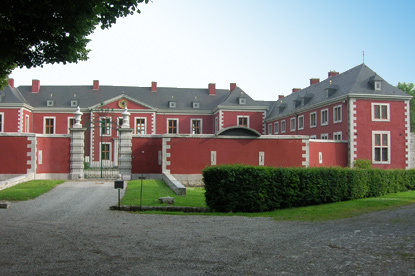 Archdeacon Mathias Clercx purchased Aigremont from the La Mack family, and constructed the present classical-style castle in 1717. The sobriety of the castle's exterior contrasts sharply with its baroque interior, which enjoys some of the finest wall paintings and decorations in Belgium. The various paintings by Flemish, Walloon, French and Dutch masters, and the Louis XV and Louis XVI style furniture is not to be missed. The gardens were laid in classical French style with two terraces and a few pavilions. The castle is open only on the journées du patrimoine (heritage days, a few days each year) or on demande for groups of 25 people minimum, except from December to February. Admission to the castle is 2.5 €. Aigremont is located approximately 10 km outside the centre of Liege, in the suburb of Awirs. Coming by car from Liege, follow the Meuse embankment (N617 road) towards Flémalle. A few hundreds meters before arriving in Engis, turn right towards Awirs (Rue d'Awirs). You will see the castle on the right-handside of the road. Continue until the centre of the village. Once the main road curves to the left, take the street continuing straight (Sart d'Avette). You will reach a five-road junction; take the first on the right (Bois des Moines), go straight for about 400m, and there will be a small road on the right going through the woods. That is Rue du Château d'Aigremont, leading to the castle.